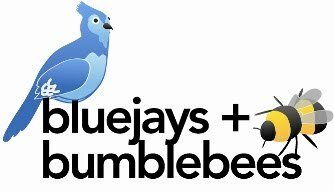 bluejays & bumblebees is a collaboration of artists justin bagley & brooke freed. justin has been making glass creations for over fifteen years. he has been an instructor at pratt fine arts center in seattle, and has trained with various artists around the world. brooke has an affinity for farmlands, old furniture, and handmade objects. she's also perpetually on the lookout for a perfect croissant. their story: it was a chance meeting in the summer of 2003. they quickly learned that they had a few things in common including a passion for creativity and a penchant for travel. they booked a couple of plane tickets to europe, traveled around six countries, and came back with one conclusion: they would have many more adventures together. bluejays & bumblebees is one of those adventures. brooke and justin are inspired by the places they travel, near and far, and design and make the artwork in their shop. For up-to-date information, find us on Facebook!